Grading is the process of manually moving earth, soil, and rocks to achieve a desired slope or topographic change. Many small (but effective) grade changes can be made with a strong back and a shovel. 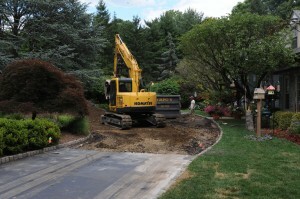 Larger grade changes usually require a professional contractor and powerful machinery. Grading is essential to stormwater management and control, because even slight topographic changes can change the direction and speed of water flow on a given site. Grading is also a necessary part of virtually all new construction to meet codes and control water movement, whether it be grading a driveway and grading a small patio to ensure water does not flow into your home.